At first glance, Pul Prahaladpur, a nondescript locality of Delhi bustling with some of our country’s teeming populations may invoke casual curiosity in an outsider. Tenements and houses seem to sprout up out of every corner and navigating through its narrow back lanes seems to humble most who venture out here. But for the urban thrill-seeker, to step inside of Pul Prahladpur’s microcosm and to take in the assortment of sights, sounds & smells as hordes of people pass you by, the experience of anonymity seems almost achievable. Yet under this blanket of anonymity are those who fight personal wars for establishing their relevance in a place too used to its own shadow. One of them saunters out from the mechanic’s workshop, a white book in his hand, and waits for his friend who his reciting his morning prayers at the square. Together, they make their way to a door after dodging a puddle and crossing a few alleys where they see others of their ilk lined up. They talk in groups and go silent as they see me approach the door. I somehow comprehend the cause of their silence. Huddled whispers follow. I smile at them nervously and make my way inside the building to hear the sound of others like them, speaking English sentences out loud in unison. A board placed on the door reads ‘Dherya – Ek Sath Ek Vishwas’. At the door, I am greeted by the founder Ms. Priya Srivastava, who has been running Dherya since its inception in 2013. Meanwhile, the learners rush in, almost falling on top of each other, their eyes gleaming, barely containing their excitement. “It’s their second day today. They are all learners in the Teach India course.” says Ms. Srivastava as a young learner steals a mischievous glance at the well-dressed stranger in the room. I proceed to shake his hand and ask his name. “Kuldeep” he says proudly. Ms. Srivastava tells me Kuldeep aspires to be a police officer one day, for which English communication skills are necessary. There’s still ten minutes before the class starts and all the learners are already going through their course packets, undoing the plastic carefully so as to not spoil it. I take a seat and survey Ms. Srivastava’s quaint little office before I begin her interview. Q. What was your motivation to start Dherya? A. I joined Teach India as a volunteer in 2010. After doing a few cycles of imparting English skills to the learners, I felt very self-actualized. During all those hours of volunteering, I believe I was quite close to realizing my life’s greatest calling – being of service to others in society. Immediately after completing my last cycle, I decided I would not let anything stop me from doing what gives me the most joy. Yes, it was a big change and the fear of failure was inevitable. But I held tight, and within months of starting Dherya, I received Teach India’s support to start English classes. And that’s how it began. Q. What services does Dherya offer to the local community? A. “Apart from Teach India’s Spoken English classes, Dherya also offers classes in Computer, Art & Craft, Abacus, Dance & many more. I realized that there was a clear need for enabling the youth of this locality to become financially independent. There are so many stereotypes that exist in this area even today. Many parents are not convinced whether sending their kids to take English classes will be a good idea or not. I have made sure that illiteracy does not restrict a child’s opportunity to succeed. I share cordial relations with many learners’ parents in this area and make sure that I convince them of the bright future that lies ahead of their children if they are allowed access to enriching education. Q. What are the some of the hurdles that you have faced in your journey so far? A. Like I said before, the biggest problem was to get the parents to send their children to the classes. Despite Pul Prahladpur being an urban locality, a lot of the residents here refuse to adapt to the ways of the changing world. Girls parents’ so far, have been the most difficult to convince. While I see where their rationale comes from, Dherya’s female success stories have proven everyone wrong. The female learners who complete their course here go on to not only contribute to their family income but to also stand proud of their hard-earned achievements. And that is something worth working for. Of course, there are other communal pressures on learners too, but over time this has got much better. Q. Finally, what is your maxim for leading a life of service? Honesty. It is the most important virtue for anyone in any field. Your thoughts and actions should be in complete synchronization. If they’re not, it is a clear indicator of dishonesty. I started Dherya because I understood that young people in India have to overcome many hindrances to gain a decent education. In their mind, they might aspire to be great scientists, engineers, artists & teachers but circumstance renders them to believe that these things are not meant for them. Hence, there is an ever-present need to not only instil this virtue of honesty in young people but to also make sure that the foundational virtue of people in the social work sector is honesty. 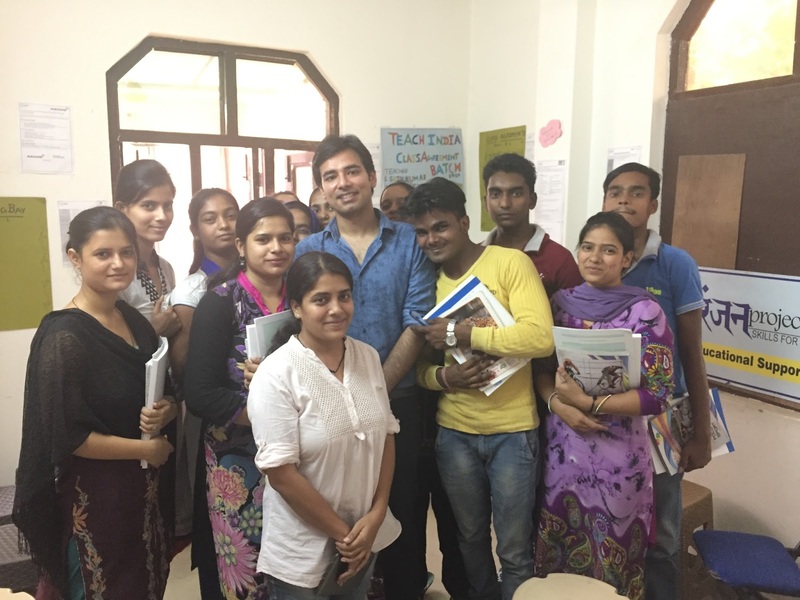 Enthusiasm walks in the room in the form of Mr. Ujjwal Chhaba, a pilot, volunteering with Teach India for the first time. As soon as he walks in the room, the learners’ eyes are transfixed on him, and his on them. There is almost a surreal connection between the teacher and his students. I sit quietly in the background and pretend to take notes but I’m more fascinated by the ease in which the learners are responding to him. This is only the second day so far, so today they are learning how to introduce themselves in English complete with pleasantries and grammar rules. I must say it is a morally rewarding experience to take part in the class and slowly see the students accept me as a part of their own, even to the point of letting me take part in a game about color identification. When a question is asked in an everyday classroom, most students conform to the answer they hear from me the other and all respond in unison. Now, Mr. Chhaba goes the extra mile to ensure that he doesn’t move to the next lesson until each learner can introduce themselves in immaculate English. And the result is extraordinary. Twelve learners, who were clueless about the direction of their lives till the previous day, take great strides in changing their circumstance today. The classroom erupts in sounds of introductions going back and forth across the room. The proud teacher walks to the various groups engaged in the conversation, smiling to himself, correcting errors along the way. “This is just the beginning” he says earnestly. By the end of the day, even the shiest boys and the most demure girls are extremely responsive, answering every one of their teacher’s questions with glee. Some even raise questions. The spectacle is brilliant. Later that evening, Kuldeep comes over to me and shakes my hand again. He says “You have a camera. Let us click a photo together.” All of the learners join in and coax a reluctant Ms. Srivastava and Mr. Chhaba to join in too. Now, I promise I didn’t put them up to this but when they posed they all screamed “We love Teach India”.